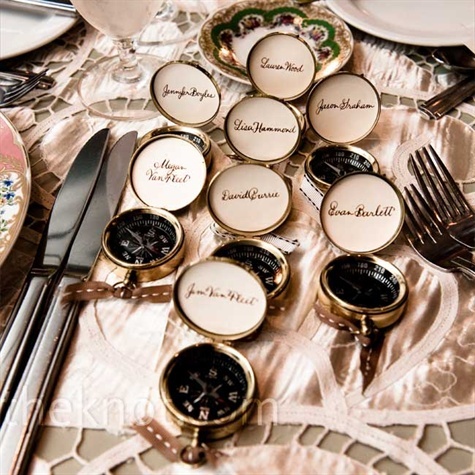 A Picture Perfect Peek at Three Tremendous Timepieces of the Raymond Lee Jewelers Inventory… Today. The Rolex Submariner 16610 is the classic diving watch. It’s 904L stainless steel case is able to withstand depths up to 300 meters (1,000 feet). 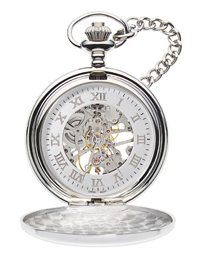 With a 40mm case it is on the larger size for gents watches. As a standard, men’s watches are usually 36-40 mm. The Submariner remains one of Rolex’s most popular watches. Not only is this gorgeous timepiece classic, it’s also on-trend; GQ’s September cover features Jets quarterback Mark Sanchez wearing this bright, modern timepiece. This 18K white gold stunner features a Tahitian Mother of Pearl dial that lends an air of sophistication and uniqueness. Add to this the double row of diamonds encircling the face of the watch, the scratch resistant sapphire crystal, and the diamond dial, and this watch becomes a true collectors piece. Introduced in 1963, the Daytona collection was designed to fit the needs of racecar drivers. Whether you’re looking to perfectly measure your lap time, or you’re simply a fan of beautiful timepieces, this particular Daytona is in a league of its own. 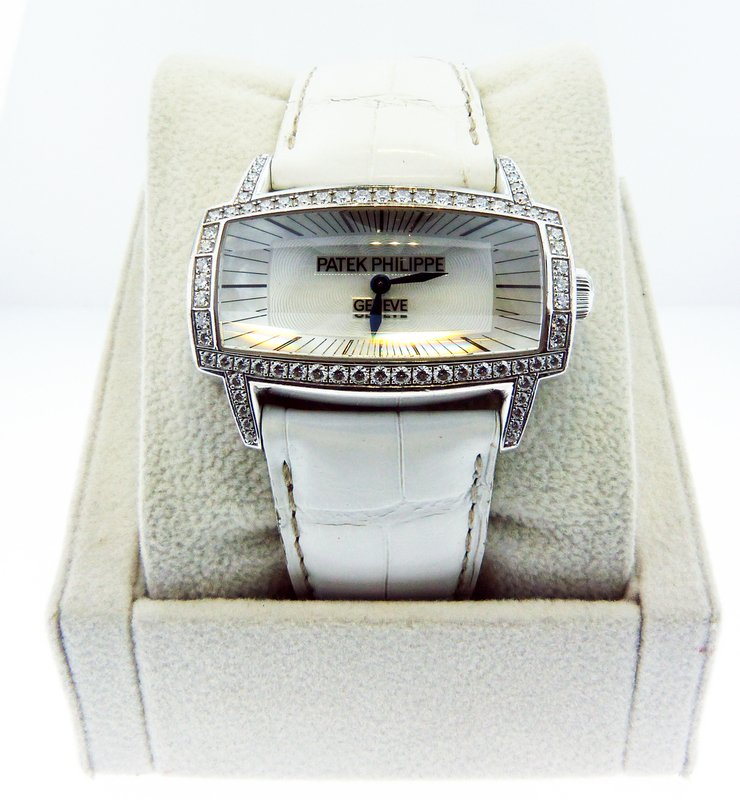 Cased in white gold, the dial is mother of pearl with diamonds, surrounded by a bezel of diamonds, and capped off with a supple black leather band. Readers, which of these pre-owned luxury watches would you most like to own? Liz for Raymond Lee Jewelers, South Florida’s choice for pre-owned Rolexes and luxury timepieces. 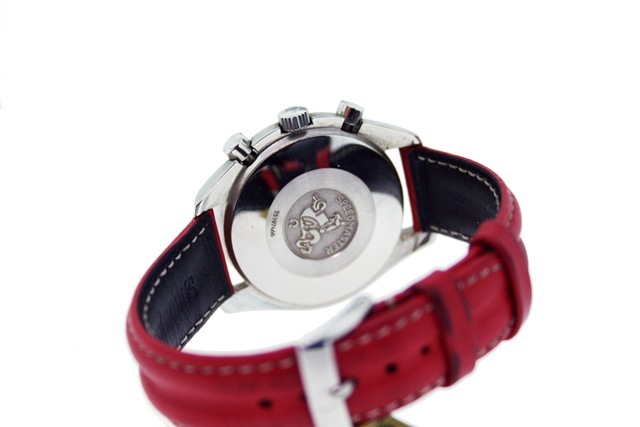 At RaymondLeeWatches.com, you can find a variety of luxury watches for both men and women. Ranging in designs and decades of creation, browse the collection of pre-owned luxury watches that we are currently carrying. On this Feature Friday, I present you with a classic two tone watch by Cartier. 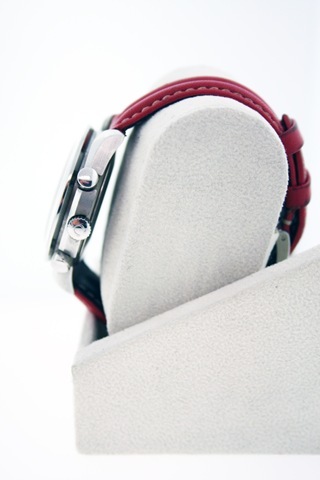 With a one year warranty and the signature panther two-tone bracelet, this lovely watch is deserving of a highlight! 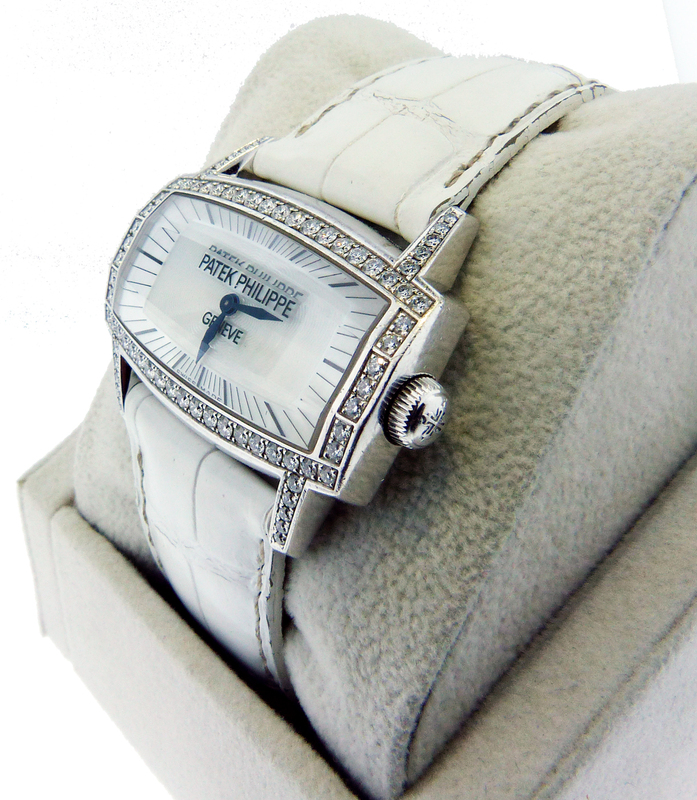 This Authentic Ladies Patek Philippe Gondolo Gemma 18kt White Gold Watch is available on the Raymond Lee Jewelers eBay Store. 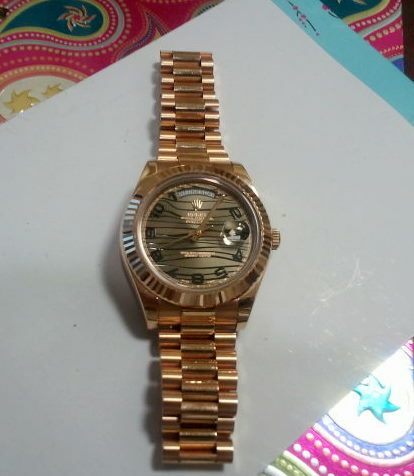 This gorgeous piece of machinery in timekeeping is available on the Raymond Lee Jewelers eBay Store. Additional Comments Factory bezel, lugs, and crown guard. Asscher cut Diamonds, inner bezel engraving. 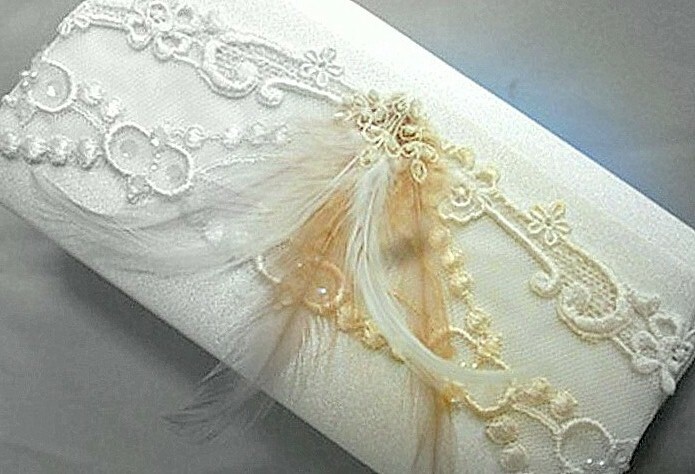 for Wallet Friendly Finds and Vintage Themed Accessories! Many of you are already aware of the genuine admiration we have for the Rolex timepiece. 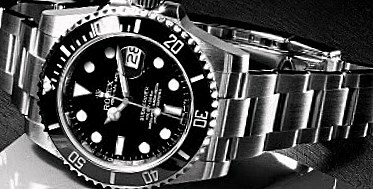 Perhaps our post outlining the logistics of a Certified Pre-Owned Rolex Watch as a Wise Investment or the Don’t be Fooled by a Faux: A Genuine Rolex Watch Reference, warning our readers of the sure fire signs that define a fake Rolex may have tipped you off as to just how dear we hold these exquisite timepieces to our hearts. 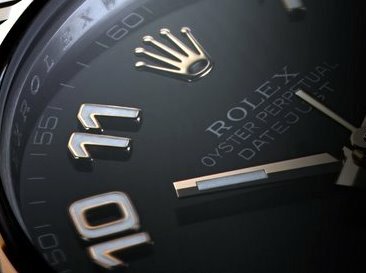 In the process of learning about the intricate engineering of certified chronometer movements, self-winding mechanisms, automatic time calibration and quartz movements that belong to Rolex timepieces, I have indeed become more of a devoted fan to the ultimate name in precision and luxury than I ever considered possible. This history and evolution of the Rolex timepiece is an intriguing, award-winning and record-breaking tale of master engineering. Rolex timepieces remain the ultimate standard of quality craftsmanship, standing the test of time in every way. The MSRP of Rolex Watch Models has been updated. The newly released prices will be effective starting today, May 10, 2011. 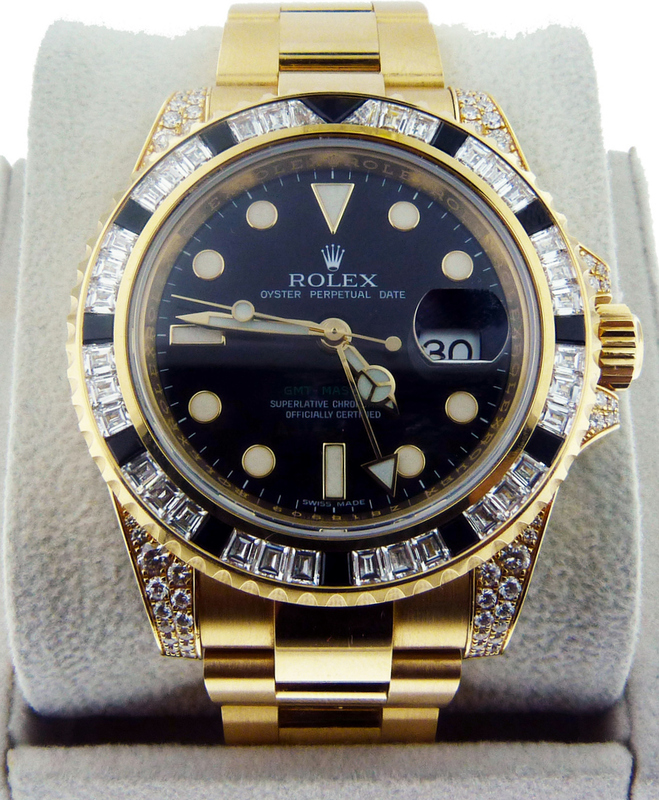 Please be patient with us, as we catalog the directory of all new Rolex MSRP prices at RaymondLeeJewelers.com. This blog entry will soon be updated with a direct link to a complete directory of updated Rolex Watch MSRP Listings, organized by Model Number on the Raymond Lee Jewelers Website. For the time being, I’d like to offer you a quick overview ofthe most popular Rolex Wristwatch Models, along with their updated MSRP values. If you should have a particular request for a Rolex MSRP that is not listed here, please email the Rolex model number you would like to see the current MSRP of to alex@webuybigdiamonds.com, and I’ll be happy to send you the requested prices as soon as possible. Prices and Model Information Effective May 10, 2011, Subject to change without notice. There’s a nice start for you! The complete Rolex MSRP list will be live shortly. that I thought would be of great value to you! 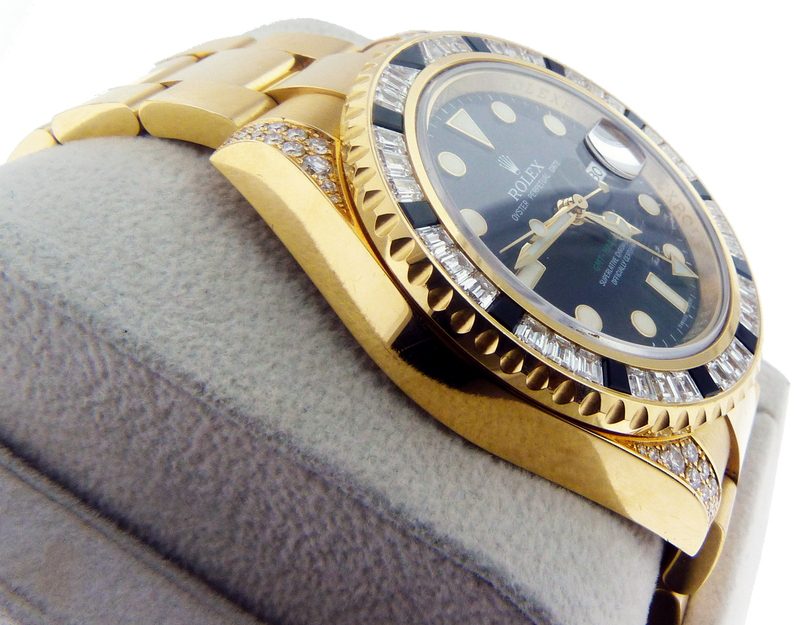 Covers an entire range of Rolex related queries! Worth Reading for anybody interested in owning a Rolex timepiece at some point! A Blog Dedicated to the Rolex Watch by Bernhard, featuring ‘rare birds’ of the vintage Rolex world and interesting, unusual facts and notations! This your chance to own this stunning Chopard 27/8419 Happy Sport Diamond Bezel Watch at an amazing price of $7,995 plus shipping Buy it Now or Best Offer! 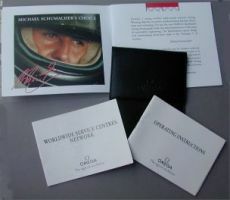 Michael Schumacher has been an Omega Ambassador since 1995. 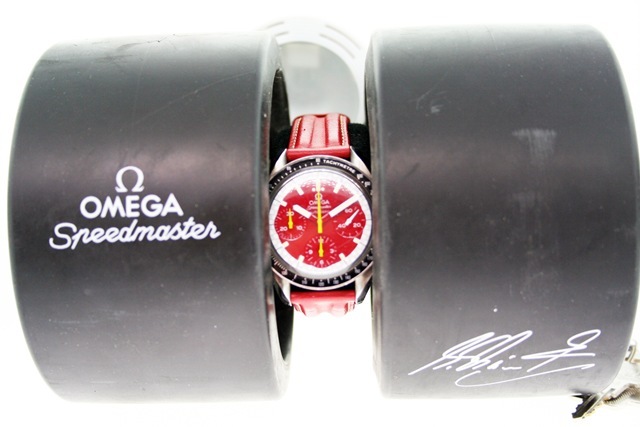 This Feature Friday Omega Speedmaster Schumacher Edition Red Chronograph watch was unveiled in July of 1996 by Michael Schumacher at his go-kart track in Kerpen, Germany. 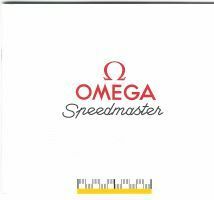 A yellow version of the Omega Speedmaster Schumacher addition was also available new from 1996 through 1999. The casing is intricate and truly impressive, with racing wheels & tires which can be pushed together to conceal the watch, and pulled apart to reveal it. To stop the tire from rolling, there is a small stand. 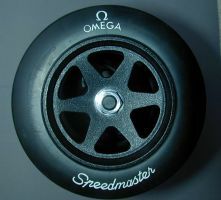 The left tire is marked “OMEGA Speedmaster,” & the right tire has Michaels displayed on it. 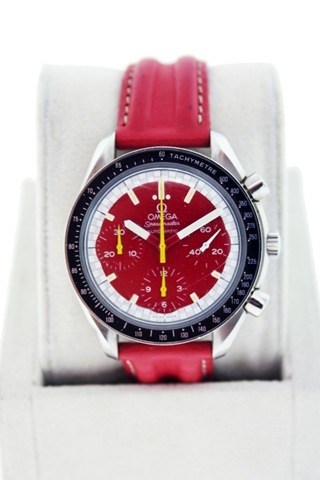 Authentic Omega Speedmaster Schumacher Edition Red Dial Chronograph. This your chance to own this Omega Speedmaster Schumacher Edition Red Dial Chronograph at an amazing price of $2,495 plus shipping Buy it Now or Best Offer. WE DO LAYAWAY! CALL US AT 1-800-329-GEMS!